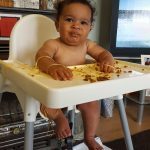 Well we are one week into Baby Led Weaning and it honestly could not have gone any better! 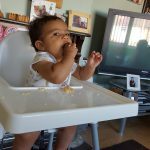 I’m so proud of the skills Lola has already learnt as well as how much she has actually eaten. 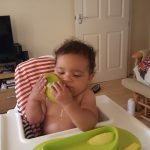 It is extremly common with Baby Led Weaning that it takes weeks or even months for the baby to learn how to eat and actually start consuming food! Lola’s first meal was strips of crumpet and some scrambled egg. The crumpet she loved sucking to death as it had a little bit of butter on. 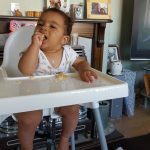 She did gag on the scrambled egg but again this is part of her learning how to eat. Thankfully that has been the only time that she has gagged. 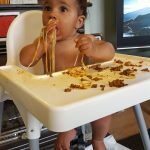 After each time she just carried on eating so it really didn’t bother her at all. 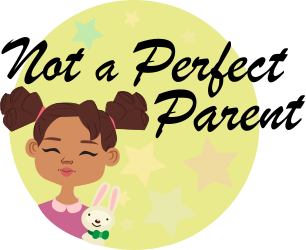 In just over a week Lola has tried so many foods and she has coped fantastically. We’ve found by far her favourites seem to be fruits. We’ve tried various vegetables but she really isn’t as interested or will try a bit and spit it out. 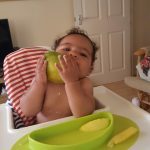 Mango, Nectarine and Orange have certainly been her favourite fruits. Babs cut Lola strips of Mango and seemed to enjoy it sucking the pieces and breaking little bits off! 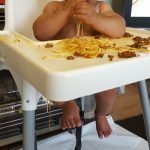 Once she was out of the high chair she saw that Babs had the rest in his hand so she instantly crawled over tried to take it. 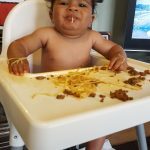 We sat her down and she couldn’t get enough of it!!! 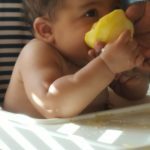 The rest of the mango was sucked to death and it was the first food that Lola truly loved. 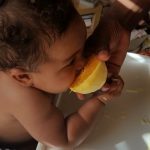 She’s since had Mango a few times and enjoys it so much every time. 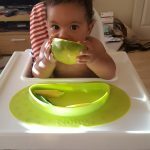 I know there are a lot of discussions about what is best whether to start with one meal a day or whether to totally go for it and give 3 meals a day. We have decided that we are going for all 3 meals a day. We feel that it is important for Lola to be used to the routine of 3 times a day. Lola is still breastfed in between feeds especially in the mornings and evenings. As it has been so hot i’ve been worried that she doesn’t get dehydrated so there has been one or two days where she hasn’t had much for lunch and just been breastfed. Until the age of 1 milk is still a babies main feed and they say “Food before 1 is just for fun”. 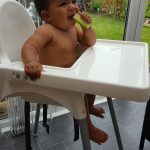 Both Babs and I are so pleased that we made the decision to start weaning at 6 months and to do Baby Led Weaning. Lola is certainly enjoying it!